Written on 12 May 2018; text in green font is not in the soundtrack. A really fun thing happened today. I’ve been learning heart-centering prayer lately, from the Catholic nuns of Los Angeles. I got a book on it, and I’ve been studying it. So every time I place my awareness on my heart, and say: Here … this little being says back to me: Here! … I’m here! … like that. I’m here! … very excitedly. And so I was doing that today, and I came across someone else, on the psychic plane, who was interested in that technique. And I was saying: Maybe you would like the word: Here! … But her nature spirit didn’t like it. So we tried: Now! … instead. And her heart nature spirit loved that. It was like: Now!!! … Like that. It was really cool. So then I was thinking about that term ‘Be here now’. When I was very young, I read a book called “Be Here Now” by Ram Dass (available at Amazon, www.amazon.com ) and it made a great impression on me. And so, because I was in a group of spiritual people, I thought: Maybe there’s somebody who would like to place that word: Be … in their heart … and we’ll see. And one of the gentlemen … on the psychic plane … said: I’ll do that! So then, he said to his heart: Be … and his heart said back: Be!! … like that, like a guy would say it. And then I said: Here! … to my heart. And my heart goes: Here!! And then the other lady said: Now! … to her heart. And her heart said: Now! … like that. It was very cool. So I guess amongst the three of us, We’re here now! Link: “The Heart of Centering Prayer: Nondual Christianity in Theory and Practice,” by Cynthia Bourgeault, 2016 … available from Amazon, www.amazon.com ..
LInk: “Be Here Now,” by Ram Dass, 1978 … available from Amazon, www.amazon.com .. This entry was posted in 4th chakra - heart chakra, Advaita - nonduality - duality, Heart clearing - unconditional love, Meditations - visualizations, Prayers - blessings - mantras - affirmations - white magic and tagged 4th chakra - heart chakra, advaita, be here now, Catholicism, Christianity, Cynthia Bourgeault, heart clearing, heart-centering prayer, meditation, nonduality, practicing the presence, prayer, Ram Dass, sacred word on 18 May 2018 by Alice B. Clagett. Written on 12 May 2018. Text in green font is not in the soundtrack. I had a thought, just now, about the beings that take care of our chakras. You know, we used to have access to seven chakras. Then we had access to 12 chakras. And these days, we have access to 72 different energy areas. Each of the first 12 chakras is cared for by a being. Some people call those the body elementals. I was wondering, though … since the beings called jinn love vortices or vortexes, and care for Earth’s energy vortexes … I wondered if very small jinn might be the caretakers of our own chakras, front and back. Suppose we had a jinni child taking care of the front of our heart chakra, and another taking care of the back of that chakra? Or suppose we had both? The body elemental for the chakra, and also the jinn children for the vortices of the chakras, front and back? Then that would mean that humankind would be in alliance with the Devic Realm, where the body elementals exist, and also with the Jinn, which I feel exist in the Plane of Forces, the ‘twilight zone’ between the third dimension … the physical realm … and the fourth dimension … the spirit or astral realm. This entry was posted in 4th chakra - heart chakra, Body elementals, Chakras, Devas - nature spirits - nature elementals, Dimensions - multidimensionality - veils, Plane of Forces: electricity - gravity - magnetism - fohat - prana - kundalini and tagged 4th chakra - heart chakra, Body elementals, Chakras, chakric vortices, Devic Realm, djinn, jinn, Plane of Forces on 18 May 2018 by Alice B. Clagett. Mudra to Clear an Artificial EMF Field from the Heart Chakra … by Alice B. Clagett . I’m in a little sub-section of Sage Ranch that’s a little bit east of the main parking lot. It’s a beautiful, sunshiny day. I’m really happy to be alive. What a bunch of days, lately! Talk about commotional energy! [laughs] Talk about clearing work! It’s just … indescribable! I’m just writing to everybody to say: Take heart! Because the best is yet to come. And this work is kind of rocky. Kind of bumpy. And it may seem like you’re on a slippery slope, sometimes. But there’s a sure course being plotted for each one of us, individually. And it’s up to us to look up, instead of looking down … to look up, for the help that’s there. … right there around you, taking care of you, and guiding your every step. But you have to ask. You have to ask your Higher Self, or one of these higher aspects of our being for guidance. Because it’s tough right now. I had one other thing to say, and that has to do with staying grounded while we’re seeking spiritual advice from those ‘far above’ us: I think it’s important to feel our feet. And to feel, around us, the energy of Earth. And to feel, above us, the guidance of all these wonderful beings and spirits. And that way, we’ll remain like lightning rods for the incoming energy. We’ll remain true to ourselves. We can feel our pranic column energy … the energy of our ‘central vertical power current’ or ‘kundalini’ or ‘antahkarana’ or ‘silver cord’ or ‘silver thread’… and we can feel our physical bodies too. And we’ll never get swept off our feet by the new energies. Or too engrossed in the clearing, to the point where we’re concerned about the things that are coming up, instead of allowing ourselves to transform them and clear them from Earth. And in the feet, that connect us to Mother Earth. You all, take care! Love you lots! Talk to you later. This entry was posted in 4th chakra - heart chakra, 7th chakra - crown chakra, 9th chakra, Angelic realm, Ascended masters - saints, Ascension team, Central vertical power current - pranic tube - silver cord - antahkarana, Earth - Gaia, Grounding - earthing, Incoming light - grace - leveling up, Kundalini (see also 'Plane of Forces'), Transformation - personal alchemy, Transpersonal chakras - 8th to 12th, Yoga and tagged 4th chakra - heart chakra, 9th chakra, angels, Antahkarana, Ascended Masters, ascension team, central vertical power current, Chakras, crown chakra, grounding, heart chakra, incoming light, kundalini, Kundalini (see also 'Plane of Forces'), Mother Earth, pranic column, pranic tube, silver cord, silver thread, transformation, transpersonal chakras, trilocating on 5 March 2018 by Alice B. Clagett. WILL THE EXPERIENCE OF PHYSICAL FORM BE DIFFERENT NOW? We hear about chaos as a vehicle for change, for establishing New Life on New Earth. Sometimes people think of chaos in terms of world events … earthquakes, hurricanes, abrupt changes of government, bank failures, economic slowdowns, and so on. Abrupt world events, because of the global nature of mass media, do affect many people by sending waves of fear, anxiety, and anger through the collective. But I’d like to explore the concept of chaos in a more personal way. When my own heart feels happy, I can feel the subtle energy of the heart chakra spinning round evenly, balanced, ‘uneventfully’. When I feel the touch of fear, anxiety, anger, hatred, worry, bewilderment … any negative emotion … I can feel a change in the subtle energy of the heart chakra. It may feel frozen … no longer spinning … or off kilter. It may feel as if there is a little pebble on one side or the other, interfering with the flow. I may feel a sudden twinge in my physical heart, or an unpleasant burning sensation. So for me, when my heart is not open and spinning carefree — that’s chaos. Not everyone senses subtle energy, but we all notice our physical aches and pains. When the heart chakra is not in perfect balance, that can create physical imbalance as well. Then we feel the physical aches and pains. So these physical aches and pains are a message to us, that our heart is not flowing freely. And the organs affected, the ones that ache or hurt, are encoded with the particular imbalance that is occurring in our heart chakra. The current chaotic state in which humanity finds itself is manifesting in quite a wave of people as physical illness and death. What to do? Naturally, a very good avenue is to cleanse the physical body through fasting and a carefully planned diet, and through drinking lots of pure water, if that is possible. For those on dialysis, where water intake is limited, then it’s a good idea to drink only very pure water and to bless it with ‘Om’ right before drinking it. I feel it’s good to bless food with ‘Om’ as well. That way the nourishment we take will uplift our Spirits as well as our physical forms. But sometimes, despite our best efforts at preventive health care, bodily imbalances occur. If, despite our best efforts, our body becomes ill, and if the pain is great, our hearts wish very much for relief, and so any agent that quells the pain is a good thing, because it helps our heart. Lightworkers who have been on Earth through many incarnations are among those who are having a difficult clearing. Sometimes, I feel, this is because their many incarnations have resulted in a great deal of karma that needs to be unraveled. Sometimes, as lightworkers, they have taken on … either in this incarnation or in past lives … the karma of other people. Daniella Breen (2) has talked about this. Sometime they have even taken on the karma of a flock of people. And in this lifetime, when, because of the Incoming Light, everything is clearing at such a rapid pace, those with a heavy load of karma … whatever the cause … may manifest the clearing as physical illness, even illness that leads to death of the physical body. Death is about the most chaotic event that we can imagine from a personal point of view. In 3D and 4D, this is the biggest change, the biggest transformation, that can happen to a person … to leave the physical body and the personality behind, and step back into our Soul nature. Naturally, there’s a lot of fear and misunderstanding around this dropping-the-body event. Denial, anger, bargaining, depression (understandably! ), and finally, often with the prodding of constant pain … acceptance. That’s how the personality reacts to the prospect of death. But what about the Soul? If we relate to our Soul the path through death to the deathless state is much clearer, much more simple, far more happy. Our soul is eternal, not mortal. True, it touches down into physical form from time to time to accomplish some mission and to further its long-range Soul purpose. So by relating to our Soul, we begin to take death somewhat less seriously. We’ve been privileged to participate in this time of the Great Turning, at the absolute nadir … the darkest point … in human history. Those of us who have had the good fortune to be physically embodied in the last few years have experienced the most miraculous turnaround of the Dark to the Light … I can’t even begin to describe it in words, it’s that absolutely amazing. Two years ago, I would have said, impossible. Well, the impossible has been accomplished, and we who are on Earth today have witnessed this greatest of changes. Some of us, especially lightworkers, wayshowers, and gatekeepers, came here at the time of the Shift to accomplish a Soul mission. Teamwork would have been involved, sometimes with others on the Earthly plane, and invariably with our AscensionTeam and our disembodied Soul lineage. We knew the odds were against us before we embodied … but we agreed anyway. That means all lightworkers, wayshowers, and gatekeepers here today are the most courageous of spirits. Incredibly courageous. That, in itself, is something to be grateful for. We may or may not have achieved our primary mission, but we’ve done our best under the most trying of circumstances. And in all likelihood, we arrived here with several soul missions, and some of those missions have, in fact, seen fruition. But in some cases, at great cost in terms of physical wellbeing. My understanding from Bill Ballard (3) is that, since Earth is already in 5D, things will be very different for those who leave physical form now. There will be no long holding period, when our Soul is absorbing the most recent incarnation and learning life lessons on the astral plane. Instead, according to Bill Ballard, when we finally leave these bodies, we will have two choices … to go directly to Supreme Source, or to re-embody. If we choose embodiment, our new body will be attuned to the Incoming Light, and it will be easier for us to unfold our new talents and take part in the co-creation of the new reality … an Earth where all are served equally, where, as the ancient Buddhist prayer says, all beings can be happy, all beings can be safe, all can live in their true nature. It’s up to your own heart to choose, and either choice is fine. fold up our physical bodies into a tiny traveling case and exist as beings of light in a disembodied state for a while. Then unpack the suitcase and walk around in human form again. Sounds pretty wild to me, but the train has been travelling through some pretty thrilling countryside in the last 2 years. The scenery is looking more beautiful every day. How might it look to those who drop body during the current chaos, and who then choose to re-embody? Who can tell? Without a doubt, it wlll be a life of wonders beyond our current ability to even glimpse or imagine. Link: SatPrem: “Sri Aurobindo, or the Adventure of Consciousness,” http://www.aurobindo.ru/workings/satprem/adventure_of_consciousness_e.htm#021 ..
(2) Youtube Channel: “Daniella Breen,” https://www.youtube.com/user/Consciousnesscall ..
(3) Youtube Channel: “Bill Ballard,” https://www.youtube.com/user/pearls2u/featured .. This entry was posted in 01 - Physical body (3D), Ascension, Ascension skills, Chaos theory - butterfly effect, Clair senses, Courage - strength - nobility, Death, Dimensions - multidimensionality - veils, Health - healing, Heresies, Hinduism, Karma - incarnations - causal reality, Lightworkers - gatekeepers - pathfinders - starseed - wayshowers, Natural disasters - earthquakes - wildfires, Neo-Hinduism - Neo-Vedanta, Social unrest, Soul purpose - Soul mission - Soul evolution, Star brothers and sisters - exobiology (see also 'Council of Nine') and tagged 4th chakra - heart chakra, 5D, anger, anxiety, Ascension, Ascension skills, bank failures, bilocation, Chaos theory - butterfly effect, clairs, collective consciousness, courage, Death, disease, earthquakes, economic slowdowns, fear, group karma, healing, health, Hinduism, hurricanes, illness, karma, lightworkers, multidimensionality, natural disasters, neo-Hinduism, Neo-Vedanta, physical form, physical form heresy, physical health, reincarnation, Shift, Social unrest, soul mission, soul purpose, star brethren, teleportation, Turning, weather on 3 February 2018 by Alice B. Clagett. I’ve been on a hunt for the Hridaya Chakra, the deepest and most sacred energy of the heart chakra. As with many things in the spiritual realm, there’s disagreement about it’s location. Some folks feel that Hridaya is a name for a minor portion of the Anahata, the heart chakra in the center of the chest. I have my own ideas about this … I felt that the Hridaya might be a point deep within the Anahata … not a minor point, but the most important point in the human electromagnetic (EMF) array. On that supposition, I recently I tried meditating at heart level, at a point between the center of my chest and my back at heart level. To avoid confusion, I’ll call this the Deep Inner Heart. I was struck by the shape of the energy I felt … it was like the shield we often see behind the statues of the Buddha. It was behind my back, just touching the back of my body, and connected to it through that physical point I was concentrating on. 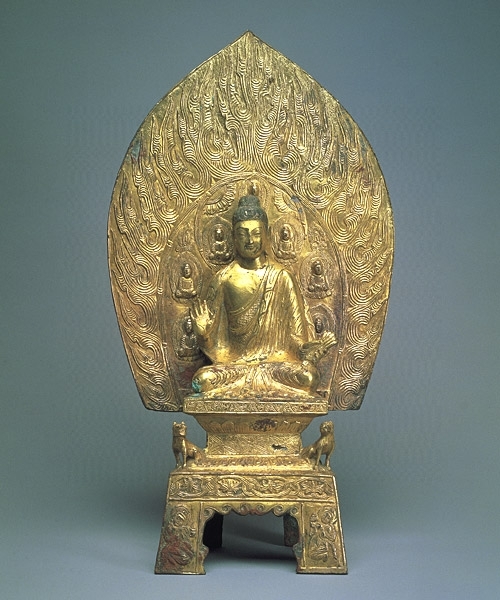 Image: Gilt Bronze Shakyamuni Buddha Statue, with a shield of energy behind the Buddha: https://www.npm.gov.tw/att/exbit/04000459/b_08009736.jpg ..
Intuition told me that I would begin to feel the energy of my Deep Inner Heart, the ‘shield’ energy … more and more in my physical body if I continued to practice this meditation. I also got the feeling that the shape of the shield was just a ‘first contact’ shape. That my Deep Inner Heart energy was, in fact, much more huge, and that I would experience it in different ways as time goes on. Further, I got a warning feeling not to move farther behind the front of my body at heart level, in my awareness … not to concentrate my attention just outside and behind my body at the level of the heart. I tried it anyway, being the curious sort … The alarm bells started ringing in my bodily sensations, and the visual field started to turn black. I stuck with it for a minute, but there was nothing behind my backbone worth exploring. The whole experience, I gather, lies in the connection between the Deep Inner Heart and the physical body … in other words, bringing the energetic shield, the protective energy of the Deep Inner Heart, into the physical body. (1) Link: Free eBook “The Great Awakening,” by Bill Ballard, https://www.shiftfrequency.com/great-awakening-bill-ballard/ ..
(2) Link: “The Desireless State,” by the Theosophists, https://wp.me/p2Rkym-5TE .. This entry was posted in 4th chakra - heart chakra, Astrogeophysics - EMF - hologram, Buddhism - Zen, Heart energies, Hridaya, Meditations - visualizations, Protection - sanctuary, Void - zero point - null point and tagged 2u3d, 4th chakra - heart chakra, Buddha, deep inner heart, desireless state, ground zero, Hridaya, hridaya chakra, human EMF, meditation, meditations, null point, protection, Shakyamuni, zero point on 3 February 2018 by Alice B. Clagett. This entry was posted in 4th chakra - heart chakra, Advaita - nonduality - duality, Neutral mind - stillness - witnessing - compassion, Quantum physics and tagged 4th chakra - heart chakra, advaita, black hole, Deepak Chopra, duality, event horizon, how to know God, neutral mind, neutral observer, Peggy Black, Quantum physics, still point, stillness, witnessing on 29 December 2017 by Alice B. Clagett.